One of country music's most distinctive voices and legends was a man born on a ranch in a small town called Crisp, Texas that fans worldwide came to know as the Texas Troubadour, Ernest Tubb. You may not find Crisp on any map, as a quote attributed to Ernest might attest to "it's hardly a wide place in the road." He considered San Antonio his home town for that's where he had spent much of his early life. His story and career many will know already, but it's a story worth telling over and over about a man who left his mark and influence on the music he loved dearly. On more than one occasion in his early song folios, it was mentioned that Ernest couldn't really recall when he first started singing or performing. His youth was spent on the farm and ranch but when work was done, he would attend the local old time dances, that seemed to be a part of the scene in many a rural area. And it was there that he started his entertainment training, by singing "...the old time songs accompanied by the small string bands that played for these gatherings." Like many singers, Ernest found an interest in music and singing at an early age. While growing up in Texas, Ernest found his musical inspiration in the Blue Yodeler himself, Jimmie Rodgers as many did back then and still do today. Jimmie Rodgers was more than just a passing interest for Ernest - he started off trying to sing like his hero, but once he lost the ability to yodel, he still found other ways to honor the man. But that's getting ahead of the story a bit. We'll see how Jimmie Rodgers was a part of his career as we tell Ernest's story. The beginning of this legend's career found him playing his first mail order guitar with a string band over a station in San Antonio. He found work initially singing over radio station KONO in San Antonio, Texas. But his popularity was such that he soon had his own program. singing the many tunes of Jimmie Rodgers he had learned by listening to the records of his hero and would do his own renditions on his radio show, accompanying himself on his guitar. He even wrote a song about that first experience, "When I First Began To Sing." We learn along the way that while he had the desire to be a singer and radio star, the reality was that those jobs didn't pay enough to make ends meet. He took a job with a local drug store, becoming manager but kept up his efforts on the radio in his spare time. About this time in Ernest's life, Ernest had met a lady named Elaine Cook. They were married on May 26, 1934. Like many country songwriters, they found their inspirations for their tunes in their own life experiences. Ernest found inspiration in his wife and the song "Blue Eyed Elaine" is testament to that. Even Gene Autry recorded the tune for the OKeh label. An early article indicates that she did some singing herself and while they were in San Angelo later, actually made some personal appearances with Ernest. But raising two children was demanding of her time and efforts and she retired from performing. 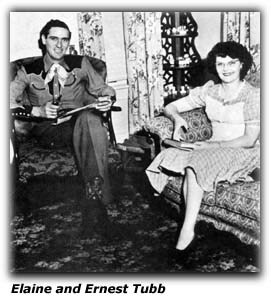 Ernest and Elaine had two children, daughter Violet Elaine who was affectionately known as Scooter Bill and son, Justin Wayne, who later grew up to be a country star and member of the Grand Ole Opry himself. We mentioned Ernest's songwriting and where he got his inspirations these early days in his career. There are other early tunes that he wrote that gave us some insight into what was happening in his life then, intended or not. Tunes such as "My Baby and My Wife", "Our Little Yodeling Boy" and the sad tune, "Our Baby's Book", perhaps a way for Ernest to deal with the grief they felt at the loss of their son, Rodger Dale Tubb (born July 19, 1938, died September 9, 1938), when he was only seven weeks old. In a 1969 interview, Ernest talked about this song. He said he never mentioned it was a true song until about ten years after he released it. Yet, he said in the first year or so after it was released, he had heard of nearly 300 babies that were named Rodger Dale. He said, "The people, they didn't have to ask if it was a true song, and I still run into people that mention it to me and introduce their children as Rodger Dale." In an early article on Ernest's career, it tells of how Ernest found himself one day looking through the telephone directory for San Antonio and finding the name, Mrs. Jimmie Rodgers. As one who idolized Jimmie, Ernest took a chance and when he found it was indeed the wife of his idol, struck up enough courage to introduce himself and ask if he could get a picture of Jimmie, how Jimmie was his idol and invited her to listen in to his programs on KONO. She graciously took the time and fulfilled his request for the photo, but not much else was heard from her after that for a time. 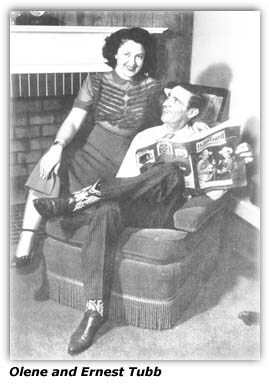 Mrs. Rodgers wrote in a letter to the Ernest Tubb Fan Club journal in the Winter of 1958, that she had first met Ernest in 1936. 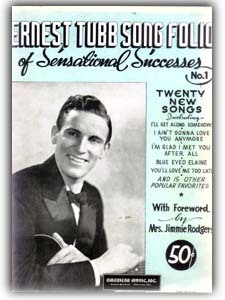 But the listening audience for his programs now included Mrs. Jimmie Rodgers, or Carrie as she was known. She took a liking to Ernest's singing and efforts. Eventually, Ernest got to meet and know her, establishing a life-long friendship. Mrs. Rodgers so liked Ernest, that she gave him the guitar that Jimmie had used. She encouraged Ernest, and in fact also tried to help promote him for a time, too, becoming his manager. She also encouraged Ernest to sing in his own style rather than trying to copy Jimmie. Of all the artists I've auditioned since the passing of my husband, Ernest Tubb is my choice. 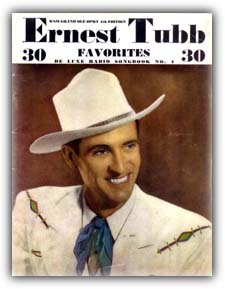 I think America's Blue Yodeler would have been proud of my having selected Ernest Tubb to sponsor as he has proven worthy in every respect. He has the voice, personality and ability to put the feeling into his songs that have won him many admirers among Jimmie's fans and Ernest is very grateful, as Jimmie Rodgers has been his inspiration since his youth. For radio work and personal appearances, as well as recordings, I am proud to extend to Ernest the privilege of using Jimmies famous guitar, for which privilege he has expressed his gratitude. Then it came time to leave San Antonio, and his career took him to San Angelo, a town in southwest Texas. He was based there for a few few years, working for a mattress company, who also sponsored his show. During this time, he hooked up with the Victor Company and recorded eight sides for their Blue Bird label during 1935 and 1936. He was later signed by Decca records and did his first record for them in April 1940. 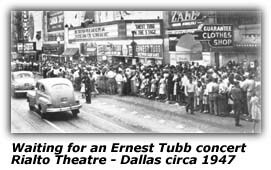 In early 1941, Ernest moved to Ft. Worth and began doing several programs over radio station KGKO. It was a different spot for him this time for the radio job was his only job. His initial pay was on the low side, but soon, a sponsor, Universal Mills stepped into the picture and helped Ernest get more visibility. It was around this time he wrote the all-time country classic tune, "Walking the Floor Over You." By this time he had also secured a recording contract with Decca and when this song was finally released, it was a bonafide hit and topped the jukebox hit parade. Among the notables that recorded his tune was the pop crooner of the day, Bing Crosby. With his recordings becoming favorites of the fans everywhere, it opened doors for him as you might expect - the movies were one, an aspect of his career that we touch on elsewhere in this essay. Ernest had also been with Decca records for three years now. Then came the famed WSM Grand Ole Opry. 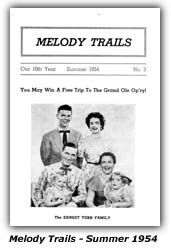 We learn in a question and answer type column in the Winter 1958 issue of his Fan Club Journal, Melody Trails, of how the Opry came calling on him. He mentions that Constance Keith, of Birmingham, Alabama mentioned Ernest Tubb to J. L. Frank after one of Ernest's appearances in Birmingham. That led to a guest appearance on the Grand Ole Opry in January of 1943. He said they then asked him to stay as a member of the cast. This appears to have happened a bit after the release of "Fighting Buckaroo". 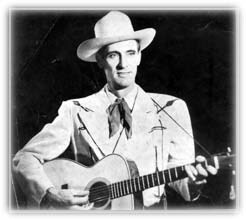 Another life-long fan of Jimmie Rodgers also joined the Opry about the same time as Ernest and would become one of his friends, the Singing Ranger from Canada, Hank Snow. By the late 1950s, there was a new singer and sound being heard on the radio waves causing quite a stir, especially among the younger crowd. A fellow by the name of Elvis Presley had come of age. But while perhaps country music struggled a bit to retain its audience or even define itself, Ernest's popularity with the fans didn't seem to lose much. In the fall 1958 issue of his fan club magazine, "Melody Trails", they list a couple of popularity polls from radio stations. One poll from a Louisville station (call letters unknown) shows that in Spring of 1958, Ernest was number two in popularity to Marty Robbins at the time and finished ahead of other legendary artists such as Ray Price, Johnny Cash, Carl Smith, Hank Snow and Hank Williams. Another poll from radio station WKNX in Saginaw, Michigan, showed that Ernest was still in the Top Five there, finishing behind Faron Young, Elvis Presley and Johnny Cash. Off and on we find a few tidbits about Ernest beyond the singing and performing that articles of the era often did. Such as he enjoyed movies and boxing. Reading was a past time of his and Zane Grey was one of his favorite authors. His favorite color was blue. He mentions once he would have been a writer if he had not done singing for his career. Though one might state that his songwriting may qualify a bit as 'writing' in one sense. His home he shared with Elaine when they lived in Nashville - considered a rest haven from the days, weeks and months on the road included horses, "...a big bunch of white leghorn chickens and several dogs." 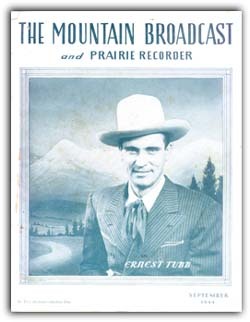 One aspect of Ernest Tubb aside from that distinctive voice and manner was the "sound" he achieved and was known for on his recordings and his personal appearances. The band through the years contained many names fans will remember. While with WSM at one time, he had a full broadcasting schedule over the air. On Saturday's he would host the Opry House Matinee show that was carried over the Mutual Broadcasting System radio network. The show was on from noon to 1:00pm CST, sponsored by the Ralston-Purina Company. The broadcasts originated from the Princess Theatre in Nashville. Later in the day, from 7:00pm to 7:30pm, he did a show sponsored by Carter's Champion Chicks. Ernest would handle the emcee chores and the band was a part of the entertainment, too. His band back then included Jimmie Short on the electric guitar, Leon Short on the straight guitar, Johnny-boy Sapp on the fiddle, Ray "Kemo" Head on the electric Hawaiian Steel guitar and "Little" Jack Drake on the bass. 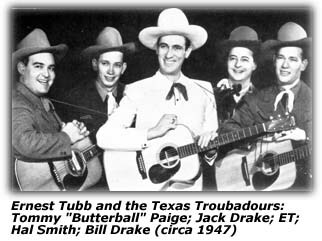 Late in 1956, The Texas Troubadours consisted of Dickie Harris, Jack Drake, Rusty Gabbard and Billy Byrd. Arthur "Rusty" Gabbard was a bit of an star on his own for some time - at one time he had his own group, Rusty Gabbard and the Valley Boys around 1950. He was also a songwriter, writing or sharing writing credit on such tunes as "Would You Like To Have A Broken Heart", "I Suppose", "You Can't Pick All The Roses", and the country classic he penned with Ray Price, "I'll Be There (If You Ever Want Me)". The talents that Ernest had in the Texas Troubadours is legendary perhaps. The band was also part of many of his other efforts early in his career, not just the long and winding road of personal appearances. They were also in the movies he did in Hollywood - in one movie, he had Jimmy Sapp on fiddle, Jimmie Short on electric guitar, Leon Short on straight guitar and Tommy Paige on bass fiddle. 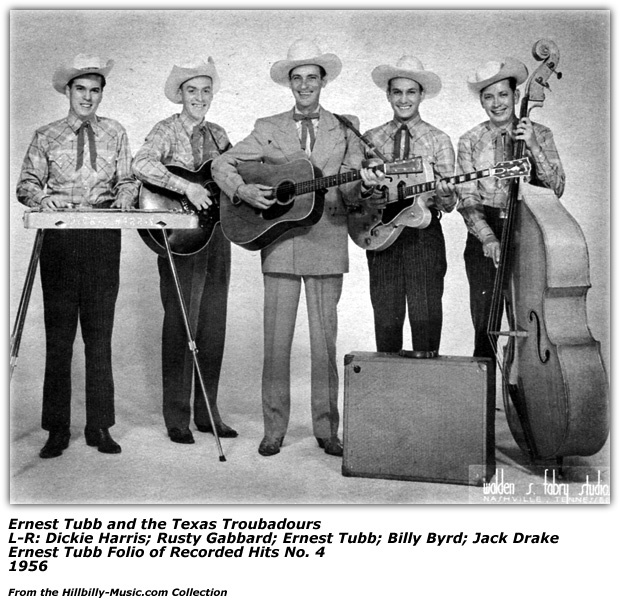 Billy Byrd is probably one Troubadour most associated with the "Ernest Tubb style" than most, with that unique guitar sound that is found in many of Ernest's recordings. But Billy had quite a career himself. He had worked with the Francis Craig Orchestra, Wally Fowler's Quartet, Owen Bradley before becoming a member of the Troubadours. Rusty Gabbard was a recording artist in his own right before becoming a part of the Troubadours. While with the group, Rusty handled the emcee chores for their shows and was on the MGM Record label. 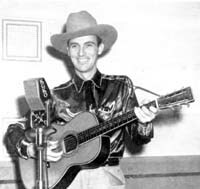 Ray "Kemo" Head was one of the original Texas Troubadours, and left for a while before rejoining the band again in 1957 or so. 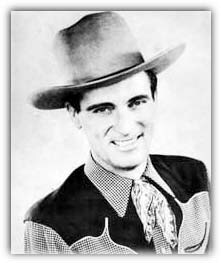 Cal Smith, was a member of the Texas Troubadours later on in Ernest's career, and became a star in his own right with such hit classics as "Hello Country Bumpkin" and "The Lord Knows I'm Drinking". Jack Greene became a member of the Texas Troubadours in June of 1962 and went on to his own career, recording the all time classic, "There Goes My Everything" as well as "Statue of A Fool" and a long-time member of the Grand Ole Opry, too. But he was a seasoned pro prior to joining Ernest, Jack was singing and performing on radio and TV with various other groups from 1944 through 1958. He was in the military from 1951 to 1953, where upon return to a normal life, became a member of the Peachtree Cowboys that had a show on WSB-TV in Atlanta, Georgia. In 1958, he formed his own group, The Cherokees. With the long road tours and personalities, the band had its share of turnover over the years, with some members leaving for a while to only be talked back into joining Ernest. And as you can see, he did find some talent along the way that was a part of his sound and shows. One of the lesser documented facets of his career was the radio show he started after joining the Opry - the Midnight Jamboree. He had opened a record shop on Broadway in Nashville, just around the corner from the Ryman Auditorium where the Opry was, giving him a ready made customer base as fans would be sure to see it and stop in while in town to see the Opry. Today, some folks might call that knowing your target market. Other stars would find it in them to open up similar endeavors on Broadway. Hank Snow at one time had his own music store where he would provide musical instruction. The author remembers one visit to Nashville, rummaging through Little Roy Wiggins' Steel Guitar City and has a Jim Reeves song folio as a memento of that visit. Today, many of those stores are long since gone, but the original Ernest Tubb Record Shop is still there on \ Broadway, even though the Midnight Jamboree is now held at the Music Village store near Opryland. But we digress. Some Opry stars found it beneficial to buy advertising time on the Opry or over WSM. Roy Acuff had done so to promote his song books and he relates in his autobiography how those song books enabled him to raise his lifestyle and better able to pay his band and bills. 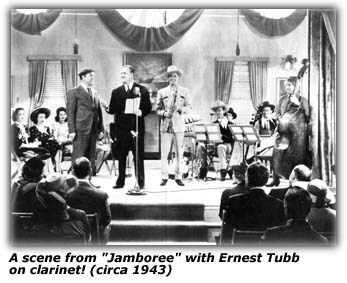 Ernest wanted to promote his Record Store of course and did so in a sense with the Midnight Jamboree that came on immediately after the Opry's last round of applause was heard. The Midnight Jamboree turned into a bit of history and institution in and of itself. Perhaps by Ernest's own business savvy. Perhaps out of a desire to help up and coming artists or local regional artists get a chance to be heard over a clear-channel radio station such as the famed WSM. Perhaps out of being at the right place at the right time. 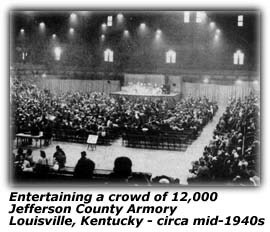 The Jamboree struck a chord with the listening audience and found its place in country music history. The show was seemingly informal for the most part as its emcee Ernest Tubb set the tone. Early on in the show's history, Ernest devoted a spot in the show where a song by his hero, the Blue Yodeler Jimmie Rodgers was featured and there would usually be some "special" going on for fans to buy a record (or today a CD) by Jimmie. That tradition is still carried on today. Beyond the setting in the record shop and promoting not only his recordings, but also those of the artists who stopped by to appear on the show, he put the spotlight on some of the young talent of the day. Through his many travels on personal appearances, Ernest's shows would often include a performer or two from the local areas where he was appearing as part of the show and would usually be part of the opening acts. This gave them a chance to be heard by a larger audience. 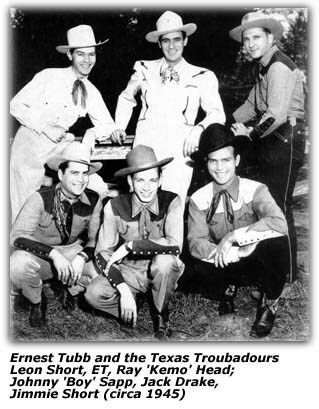 Ernest seemed to enjoy encouraging these performers, asking them to tour with them while they were in the area or inviting them to Nashville to appear on the Midnight Jamboree. Perhaps it was his way of laying a foundation of goodwill for country music in doing so. But appearing on the Midnight Jamboree and being introduced on the air by him was for some a night that is forever remembered and a story often told back home to fans. 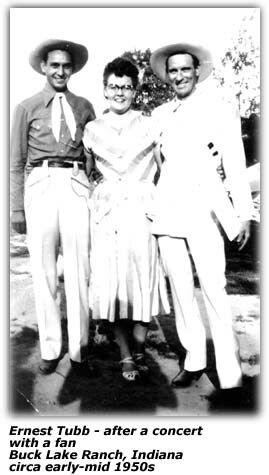 Read the story of Ray and Kay, the Banjo Kids and Ray's appearance on the Jamboree. For some, they got a chance to live that dream in Nashville and the music business and perform on a national stage and took that joy lasted in their hearts for years to come. For some, that visit led to introductions by Ernest to others in the business - a chance to make contacts. Some would get offers or encouragement. Some would be able to make the move or the next step. Some would not. Each of those trips has their own story, their own memories. In June of 2002, we had the opportunity to take in the Midnight Jamboree. Yes, Ernest is gone. But it is still unmistakably a tribute to Ernest and his career. No longer do folks have to stand in the aisles of the record store, there's now a small theatre for folks to take in the show. The emcee during our visit was another link to country music's history - Carol Lee Cooper, daughter of Wilma Lee and Stoney Cooper. The opening strains of Ernest's famous hit "Walkin' The Floor Over You" still opens the show. A tribute to Jimmie Rodgers is still done. True to another tradition of Ernest, the Osborne Brothers introduced an act making their very first appearance on the national radio stage, much in the way that Ray did decades ago. You could see that nervousness. But once that first chord was struck and the first notes sung, they had the attention of their audience. They were a family gospel singing group, with one teen-aged gal leading the way on harmonies. They got a rousing ovation from the audience. And Sonny Osborne couldn't help but comment and tell folks about the nervousness that people feel when they go stage at such a performance. He spoke of the fear they all felt at one time, but when the time comes, the innate talent takes over. He smiled as one who had been there done that. And you just know somewhere in the wings, Ernest was offering up his own round of applause and smiles. "Possibly the largest single contribution the "Midnight Jamboree" has made is to allow unknown country entertainers an opportunity to reach a national, even international audience." That's not to say that only unknown artists appeared on the show. The same article fills us in on the many stars that were on he show before they found their place in the hearts of fans such as Johnny Cash, Elvis Presley, the Wilburn Brothers, Charley Pride and Loretta Lynn. In fact, Loretta's stints on the Jamboree were so popular that one night when the Opry was short-handed, they called on her to fill a spot. She eventually did more than that in her career. Tennessee Ernie Ford was on the show one Saturday night about to sing a song called "Anticipation Blues", about a father-to-be and wouldn't you know it, he received a call that night that his wife had just given birth and he announced the news to the fans and treated them to the song. Interestingly, that same article seems to have a bit of a misstep about his first hit when he first became a regular on the Opry in 1943. The 1973 article says that Ernest did the show when Quote. "I Walk the Line", his biggest seller, was a hit. Unquote. We think maybe they meant to refer to "Walkin' The Floor Over You". Ernest also mentioned that he never signed a contract with the Opry, so he always joked, "...they can't fire me because they never hired me." Such a legacy is perhaps lost in today's Top 20 or 30 playlist mania or the aim to please some demographic segment of a market that an executive somewhere thinks a pot of gold exists. But before someone can reach that stage, one has to be seen and heard. Or at least a chance to be seen and heard. A show such as this is needed. To the stars who carry on this tradition, for finding that talent they hear during their travels and giving them their chance - shows a heart in the right place, for someone has to be able to nurture the next generation that will follow them. Early in his career, he tried his luck with Hollywood as many stars did back then, usually in western movies or some type of other setting that allowed them to include a few tunes. In one of his song folios we found news of his starring roles in a couple of Columbia Pictures movies - "Fighting Buckaroo" and "Riding West", co-starring Charles Starrett. Perhaps in a sense, these were ahead of their times for back then, they had no "MTV" or "CMT" or "TNN" to play such 'videos' of their musical efforts. They were used to reach audiences and of course, to spark interest in their recordings. During his early years when his and other Opry stars popularity was such that Hollywood beckoned to make movies, albeit, perhaps more or less B-movies, or preludes to today's videos that showcased their musical talents, but nonetheless, we have several of efforts that were of note in this early part of his career. One was "Fighting Buckaroo" made for Columbia Studios in 1943. This featured Columbia's western star at the time, Charles Starrett along with Kay Harris and Arthur Hunnicutt. 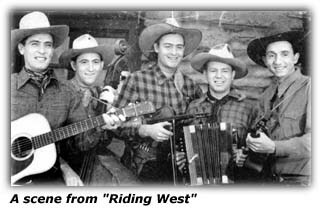 In 1944, Ernest also appeared with Starrett in the flick, "Riding West" and as you might expect, also did a few tunes. The cast of characters included Shirley Patterson, Arthur Hunnicutt, Wheeler Oakman, Blackie Whiteford, Clancy Cooper, Billy Wilkerson and others. Fans also got to see Johnny Bond (who co-wrote "Tomorrow Never Comes" with Ernest) along with the Texas Troubadours of the day. The year of 1944 also saw him appearing in a movie for Republic called "Jamboree", directed by Joseph Santley. Some of the supporting cast that Ernest worked with on that movie included Rufe Davis, George 'Shug' Fisher, Don Wilson, Freddie Fisher, Ruth Terry and Edwin Stanley among others. Another effort was the 1947 movie "Hollywood Barndance" which starred Ernest Tubb and had as the leading lady, Lori Talbott along with others such as Red Herron, Helen Boyce, Frank McGlynn Sr., Phil Arnold, and Ann Kunde. An interesting aspect of this picture is Ernest as a clarinet player. We also get to see on screen, Jack Guthrie. Jimmie and Leon Short, Texas Troubadour members are also in the movie. The movie seems typical of some of the country music films of that era, a loose story woven together that also included their band in roles and offered up situations to let them showcase their songs of the day. Maybe in one sense, they were decades ahead of what we now take for granted on those musical cable TV channels. While these may not have received Academy Award consideration back then, the fans flocked to them - in 1947, the Hollywood Barndance had fans standing outside the Rialto Theatre in Dallas to see this film starring one of their own native sons. Along the way, Ernest learned the value of the song folios not just to allow fans a chance to play their favorite tunes by the artist, but also as a way of adding a personal note to keep in touch with fans and provide a bit of news and promote his latest efforts. And he'd always thank the fans for their support and others who had helped him in those efforts. Country music stars through the years learned that one way to gain fan interest in their music as well as earn a few extra dollars beyond their recordings and personal appearances, was the song folio. It enabled the fans to take home the music of their favorite star to play themselves. Roy Acuff has mentioned how it enabled him to take a step up the ladder in his career and better able to take care of his family and band. Ernest was quite prolific in the number of song folios we have come across doing our research. We would also state that Ernest was quite generous to his fans in what he included in those song folios. In some cases, certain publishing houses, American Music, for example, would often not include not much more than a photo on the cover and just the songs inside - no little personal tidbits or other photos. But fans weren't the only audience, in one folio, he thanked fellow radio artists of the day for favoring him and playing his tunes, too, adding to his popularity. But in the case of Ernest, we'd often find what seems like family photo albums he was sharing with the fans, letting them get to know him a bit better beyond the songs and stage. We'd see pictures of his wives, first Elaine, then later, Olene. We'd see pictures of his kids as they grew up. Scooter Bill and Justin who later sang also. We'd get to see pictures of his motion picture efforts. 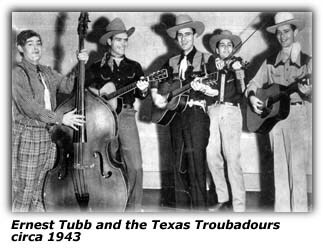 And the Texas Troubadours were also featured - giving you a sense of the history of his band through the years. Or at least through the 1950s. 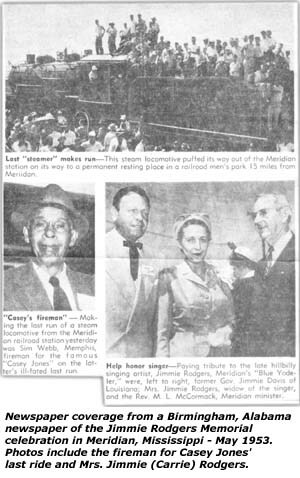 In the early 1950s, we got to see a bit of the pride he had in helping put together the original Jimmie Rodgers Memorial Celebration in Jimmie's home town of Meridian, Mississippi with his close friend, Hank Snow and also Jimmie's wife, Carrie. And of course, we'd get to see some nice portrait shots of Ernest - sometimes in the cowboy hat, sometimes without. Or other casual or informal shots. 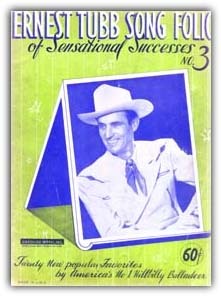 If you haven't already, you should pick up a copy of Ronnie Pugh's autobiography of Ernest Tubb and give that a read. In the first song folio by Ernest, you'll learn of the influence that Jimmie Rodgers' widow, Carrie had on his early career. That photo on the cover was a borrowed tuxedo to give him a professional look. And of course, being able to play Jimmie's guitar, too. Ernest seemed devoted to the singing idol he held dear to his heart - not just in trying to emulate him when he first started, but all through his career as you'll see. In one of those folios, he mentions they found with the fans, maybe embellishing the actual sales numbers a bit, but still showing that they struck a chord so to speak with the fans. "I am most grateful for your enthusiastic reception of my No. I radio song book. Literally hundreds of thousands of nice letters have filled my heart with gratitude to each of you. This widespread interest has indicated to me that when so many of you asked me to publish another radio song book you really meant it." We also learned of where he got his inspirations for the songs he wrote early in his career. "These songs were written from my own experiences in life or taken from the lives of others whom I came in contact with in days gone by. I believe that you will find them to be, simple and honest and I trust you will feel the sincerity in which they were written." 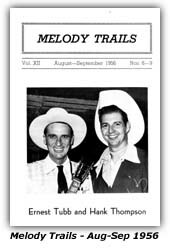 From the earliest days of his career, Ernest Tubb had a fan club that also published a fan club journal, Melody Trails. We've been lucky enough to find a good number of the mid to late 1950s issues of these publications a time when the President and editor of these publications was Norma Winton Barthel. These are not your run of the mill publications either, for the quality of the printing rivals the numerous radio station publications we've seen through the years in their coverage. What we find in those publications perhaps just reinforces what we've learned about Ernest, the family man, his devotion to the fans, the Texas Troubadours, his idol Jimmie Rodgers and lending a hand and promoting up and coming artists to get a bit of exposure. We see it all in these issues. 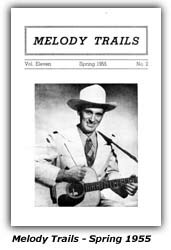 Melody Trails started in 1945. And was published for many years. By 1958, it was no longer being published monthly, for it had changed to quarterly issues. But still containing the newsy items of Ernest and his career and others. These issues were about 16 pages each and of a half-letter size, similar to some of the radio station publications of the day such as KMA out of Shenandoah, Iowa or KWTO in Springfield, Missouri. There would be regular articles by Norma Winton Barthel, a column such as "Just Driftin' With Norma...". There would be the latest news on Ernest and his family or the Troubadours; a plug for his latest recordings; tour dates and other goings on. Fans could read about the annual Jimmie Rodgers' Memorial Day Festival in Meridian, Mississippi. They'd also see a common courtesy mention of the fan clubs of other stars with a paragraph or two of them and where fans could write to join the fan club. We have several old fan club magazines from that era that were mailed to Ernest at the record shop and thankfully he or someone was a bit of a pack rat and saved them for reading down the road and finding their way to us. They'd make mention of Ernest or list him as an honorary member. Fans also got to enjoy write-ups of other stars of the day, some written by the legendary country music journalist, Floy Case. She'd write an article about a star such as Charlie Walker or Carl Perkins and had a column called "Down Blue Bonnet Way". Fans would also read articles by Mae Boren Axton. We make mention again of Ernest's efforts to promote some of the younger talents of the day, to give them some exposure. The Midnight Jamboree was one of those conduits. His fan club newsletter was no different. Often fans would find short articles on such newcomers as Norma Lee, Carl and Cliff, the Country Cut-Ups, Herschel Parker, Gale Southern, Marian Hall, Ken Marvin, Gary Williams, Glen Douglas and more. The newsy format and details provided in many of the columns are close in spirit to the early publications such as Mountain Broadcast and Prairie Recorder or National Hillbilly News in nature that country music publications seemed to copy in some aspects through the years. They catered to the fans and the folksy style lent itself well to that, inviting the fan to read a bit about an 'adopted family' member if you will and getting the privilege of meeting them when he came to their area. To have a fan club publication last longer than some country music publications gives you an idea of not only the fan base that Ernest had, but also the quality of what he gave the fans in return. In today's modern era, Willie Nelson has become known for the many duet albums he's done with many artists, sometimes not exactly from the country music field. But even before Willie did that, Ernest was doing something similar back in his hey day and through the years. Some of his earliest hit recordings were duet efforts he did with another legendary Grand Ole Opry star, Red Foley. Sometimes they were the fun tunes such as Tennessee Border No. 2 or Too Old To Cut The Mustard, but the fans enjoyed them. 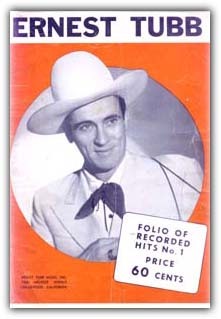 With Red Foley, he had four top ten hits from 1949 to 1953, including the number one hit, Goodnight Irene. Then there was his pairing with the Andrews Sisters on Decca in 1949, which also resulted in a couple of Top Ten hits. There was a record with another popular Decca act, the Wilburn Brothers, "Hey, Mr. Bluebird" in 1958, that was a Top 20 hit for them. The mid-1960s saw him team up with a new Decca recording star, Loretta Lynn. While the pairing didn't result in any Top Ten hits, their first duet, Mr. and Mrs. Used To Be was on the charts some 23 weeks and peaked at No. 11. Though we see they also did what appears to be a novelty tune that catches our eye, "Who's Gonna Take The Garbage Out". Another effort of collaborations was a surprise to Ernest. While doing a session with First Generation records for what would be known as the "Legend and Legacy" collection, unbeknownst to Ernest, the producer, Pete Drake, had started getting other artists to add their vocal or instrumental tracks to the recordings to provide a modern day collection of duet efforts. Late in his career, one of the last appearances he made on record was a novelty number that Waylon Jennings and Hank Williams, Jr. did, "Leave Them Boys Alone." You've seen several mentions of Ernest's efforts with fellow country singer Hank Snow to originate a day to commemorate their idol, Jimmie Rodgers in his home town of Meridian, Mississippi. Many artists will talk of who influenced them or inspired them, but how many will go the lengths that Ernest and Hank did to create a festival honoring their idol that would last for years and generations? The Jimmie Rodgers Memorial Day celebration was an event in an of itself. It took some work by the two artists to bring it about. As part of it, they had a rail spur built to where the memorial would be. A fireman from the last ride by Casey Jones attended the celebration. The coverage was astounding to say the least by the local newspaper and picked up by other newspapers elsewhere. But fate wasn't kind to Ernest at that first celebration - he was unable to attend it. Ronnie Pugh's book touches on this aspect in more detail that we can go into based on what we've found. Hank Snow's autobiography also offers a detailed account of how he and Ernest came to put together and sponsor a tribute to the man they both idolized. Early in the history of this tribute, a senator from Mississippi introduced a bill in the Senate to declare that May 26 would become "National Hillbilly Music Day" and so it was for the first few years. But as we know, for a while, there was a stigma attached to the term "hillbilly" that caused some thought and eventually the day became known as a tribute to Jimmie Rodgers. Ernest and Hank also worked the publicity angle for the tribute, too. Of course, Ernest publicized it in his fan club newsletter, Melody Trails. 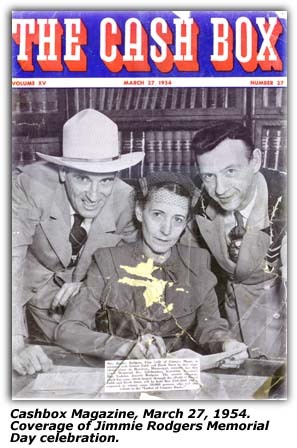 But it also got heavy play in the industry publications such as Cashbox, which ran a cover photo of Ernest, Hank and Mrs. Jimmie Rodgers in 1954. 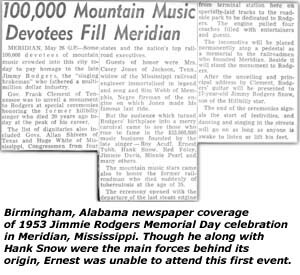 We have a copy of the May 31, 1953 edition of the Meridian Star that includes an article of a telegram received from Ernest stating that the Tuesday edition of the Meridian Star covering the "National Hillbilly Music Day" was "...the best coverage I have ever seen by any newspaper of any event." As part of that first event, they had a steam engine along with four coaches filled with entertainers and guests ride along specially laid tracks to the park where the Jimmie Rodgers Memorial would be located. The train would be a monument to the railroadmen who founded Meridian. And along side it would be the Italian marble monument to Jimmie Rodgers. The governor of Tennessee, Frank Clement was the principal speaker and presented Jimmie Rodgers Snow, the then 17-year old son of Hank Snow with a guitar once played by Jimmie Rodgers. The UP article stated that after the ceremonies, "...dancing and singing in the streets will go on as long as anyone is awake to listen or lift his feet." 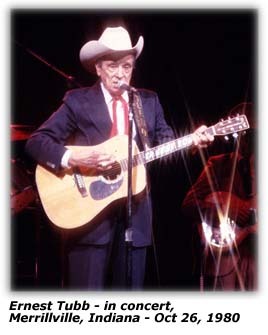 Besides his signature classic tune, "Walkin' The Floor Over You", one song that is identified with Ernest and become a classic itself is "Waltz Across Texas". The 1965 recording didn't reach number one, but has always been a fan favorite. Even nearly 16 years after his death, the tune co-written by Ernest with his nephew, Talmadge Tubb, was the tune played at the inauguration ball of President George W. Bush in 2001 as he asked his wife Laura to join him in a dance. Talmadge and his wife passed along a Ft. Worth Star-Telegram article by Bud Kennedy from January 23, 2001 about this event. The article also includes a tidbit as to how the song came about. It started in a bar when a poker game was going on and as poker players often do, they try some one-upmanship to bluff their fellow players into submission. One player commented on his hand, "I think I'll just waltz out there with about $40," as he laid out his bet on his hand ever so confidently. But another player never missed a beat and followed that with, "...then I think I'm fixin' to waltz across Texas" and then took the pot with four aces. Talmadge remembered the comment, and wrote it down on a piece of paper and took it home. Later he wrote the song at his home in Ft. Worth. That was around 1959. The song wasn't recorded then though. Mr. Kennedy cites Ronnie Pugh's book in noting that Ernest had said the song laid around for years, then he dug it out again and fooled around with it and liked it. The song was finally released in October 1965. While it didn't reach number one for Ernest, the charts didn't capture the popularity it had with fans, Mr. Kennedy notes it became one of Ernest's most requested tunes at concerts later in his career. And when the Bushes waltzed to the tune, Talmadge and his wife Bobbie were the recipients of many congratulatory phone calls and emails. "I wasn't the one with four aces. But I sure got lucky." His place in country music history was assured on October 22, 1965 when he became the sixth member elected to the Country Music Hall of Fame. The legacy of Ernest Tubb is a cherished one, a part of the lore and legend that is country music. That distinctive sound and voice are instantly recognizable by fans when they hear his records even today. The heritage and traditions that Ernest Tubb started when he first opened his first record shop and began broadcasting the Midnight Jamboree over WSM every Saturday night after the Grand Ole Opry went off the air are carried on today by the shop's current owners. You can still find one of the broadest selections of country music at his stores in Nashville. You can still go to the Midnight Jamboree after the Opry on Saturday night, to hear not only some of the stars of today, but those who will be someday or some who get that chance to be heard by a broader radio listening audience and take that memory with them forever. And while you're listening to the Midnight Jamboree, you will still hear a tune by Jimmie Rodgers and a special on one of Jimmie's recordings each week. To Ernest, we say "Thanks a Lot...."
And to all of you, everywhere, I'm wishing you the greatest thing in life - HAPPINESS. 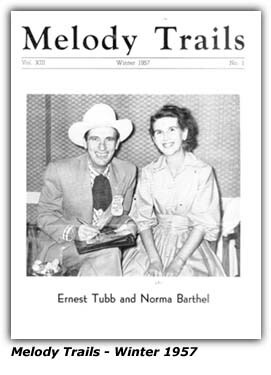 Ernest Tubb Folio or Recorded Hits No. 1; Favorites WSM Grand Ole Opry 4th Edition; 1948; Ernest Tubb Music, Inc.
31300 B What Will You Tell Them? 46308 B Why Should I Be Lonely? 6110 B Are You Waiting Just For Me?